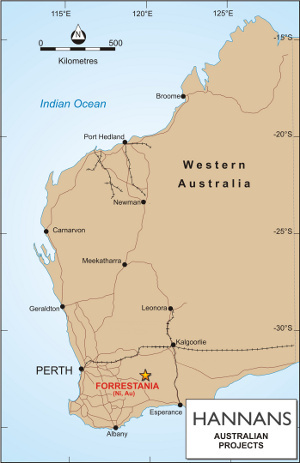 The Forrestania project is located 120km south of Southern Cross and 80km east of Hyden in Western Australia (Figure 1). 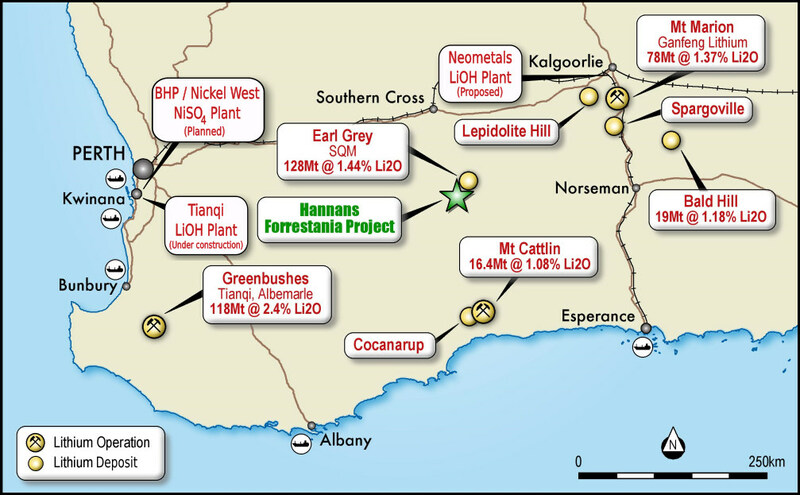 The southern portion of the Forrestania project is approximately 7km north of Western Areas Limited's Flying Fox nickel mine, and the northern portion adjoins the SQM-Kidman Resources Ltd Earl Grey lithium project. There is significant supporting infrastructure in the Forrestania-Mt Holland project area, with good road access and an existing electricity network primarily due to present and past mining operations. Located to the south of the project area is Western Areas Ltd's Cosmic Boy nickel concentrator, which can process 600,000 tonnes per annum of ore, with the potential to expand to 1,000,000 tonnes per annum. A new lithium mine and concentrator is also being developed close to the north-eastern corner of the project by the SQM-Kidman Resources joint venture. The Forrestania gold project contains a 136,750 ounce gold resource. Hannans owns a 20% interest in this resource which is free-carried until a decision to mine has been made.